I'm almost certain I went in a month or so ago and took it off auto renewal. Yeah I got the same reply. Arsegoles. Not that it'll help you all now but for anyone else who is concerned about this; I turned my renewal off a few years ago and then emailed the support team with my account details asking for confirmation that it had worked as I couldn't see it properly when signed in. I had an email back from them confirming it had and have had no problems. what's the deal with 14 day cool off and online subscritopns? Eurosport really are showing just how NOT to do customer service. I am following up your refund request. Since you have cancelled your subscription before the renewal date, I invite you to provide me with a a copy of the confirmation email you have received after the cancellation. Thank you for your corporation and I remain available for any further request that you may have. Thankfully they stored my credit card, Halifax were very helpful and thought Eurosport were taking the piss and raised a dispute no issue. I don't object to the cost or service. I just object to being automatically charged, when I am sure I cancelled it and I know i would not have knowingly given authority to store my detailed. Then eurosport iced it by being abrasively rude in response. Also, making you do something instead of taking care of it themselves. Standard tactics. Is there a code associated to the insta promotion? Yep, expires on 17th March. 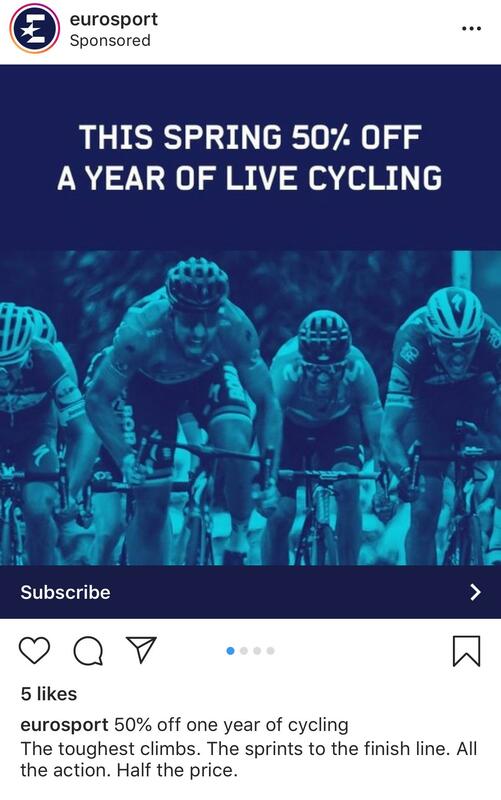 Paid £40 a week ago in time for Omloop. Never mind. Is anyone else having trouble finding the highlights in the on demand section at the moment after races? For both the Tour of Flanders and Paris Roubaix all I'm getting is the whole thing. I.e. 7 or 7.5 hours of TV. Ain't nobody got time for that.